The really good pilots use their superior judgment to keep them out of situations where they might be required to demonstrate their superior skill. At one extreme are “reflexes” that involve lots of eye-hand coordination and tactics rather than strategy. There are also some basic thinking skills, such as giving answers to clearly-posed questions. These skills are relatively easy to teach, and relatively easy to evaluate. At the other extreme are advanced decisionmaking skills. As pilot in command, you will need to make decisions in situations where it’s not even obvious that a decision needs to be made. This requires being able to notice small things as well as being able to see the big picture. It also requires not assuming that whatever procedure you used last time is going to work next time. These skills are extremely important. They are, alas, not so easy to teach or easy to evaluate. As an example: In a lesson, you might be asked to demonstrate short-field landing procedure. It isn’t your decision, since you have been told to use short-field procedure. In contrast, suppose that years from now, you want to fly yourself to XYZ airport. Your former instructor knows the XYZ runway is very short, but do you? The instructor won’t be there to tell you to use short-field procedure. What’s worse, there won’t even be anybody to ask you what procedure is called for. Will you be wise enough to ask the question on your own? Perhaps questions such as “should we be using short-field procedure?” and “should we be using this runway at all?” ought to be on the takeoff and landing checklists, but in light aircraft they typically aren’t. Let’s assume you know how to calculate the runway requirements using the POH. That’s easy, if and when somebody asks the question. Let’s assume you know how to use short-field technique. That’s not the issue. The question is, will you know whether to use short-field technique, when there’s nobody there to ask the question. There are innumerable situations that require good decisionmaking. As just discussed, one aspect of decisionmaking is to recognize that a decision is needed, even though it’s not in the form of a clearly-posed question. A somewhat-related aspect involves starting from a seemingly-small, seemingly-isolated fact, then seeing how it connects to the other facts you know, and working out the implications and ramifications. As an example of ramifications: Suppose you were expecting a 20-knot tailwind, but you’ve actually got a 20-knot headwind. For starters, you have to notice this. It won’t be obvious, unless you’re checking arrival-time at enroute waypoints, and/or checking DME or GPS groundspeed. Then you have to work out the implications. a) The obvious implication is that you’re going to be late. b) A slightly-less-obvious implication is that you might not have enough fuel to reach your originally-intended destination. If you have to divert, don’t wait until you’re low on fuel to do it. c) An even-less-obvious implication is that if the forecast is wrong about the winds, it’s probably wrong about everything else: ceiling, visibility, temperature, precipitation, icing, turbulence, et cetera. You’d be well advised to get an updated forecast. During introductory lessons, you start out with minimal responsibilities and gradually acquire more and more. Later, in non-introductory situations, I want you to act like pilot-in-command as much as possible. With one exception (section 21.2.3), everything I say is merely a suggestion. My suggestions aren’t meant to relieve you of your responsibility as pilot-in-command. For instance, if I ask you to turn right, you remain responsible for clearing the area. Please clear the area just as you would if you were solo. Also think about whether the new heading will take us into restricted airspace or some such. If you don’t want to turn right, we can discuss it. Ideally, I don’t need to say anything. If we are facing an energy-management challenge, you can notice it (the sooner the better) and deal with it. Finally: “I’ve got it.” This is not negotiable. See section 21.2.3. Remember, being a pilot means making decisions, even during lessons (except introductory lessons). During the escalation process, I’m gradually shifting more of the decisionmaking onto my shoulders. Your goal should be to take the hints at the earliest possible stage, so that further stages of escalation are not needed. As another illustration of the same idea, I try to avoid giving an instruction such as “go around”. If I see a deer on the runway, I’ll say there’s a deer on the runway, and you can come to your own conclusion about going around. If we need to do some go-arounds just for practice, I might say there’s a hippopotamus on the runway. You know it’s not real, but I want you to pretend there’s an obstruction, and come to your own conclusions about how to deal with it. Most likely you will decide to go around. At the other extreme, if you are struggling with an unfamiliar situation, I’ll just tell you how to deal with it. No hints, no escalation. There are lots of good but non-obvious techniques, and I don’t expect you to re-invent them on your own. Also note that one element of good PIC decisionmaking is knowing when to ask for help. This includes asking for clarification of an overly-vague hint. Swamped. Could use some help. Workload’s not too bad right now. If you’re swamped, I’ll help. If you’re busy, I’ll leave you alone. If you’re not busy, I might strike up a conversation about strategy or tactics, or suggest an exercise. “How about I fly for a bit?” or “Would you like me to demonstrate that maneuver?” Those are simply questions, perhaps verging on suggestions. Those are negotiable. “I’ve got it.” This is not a suggestion. This is absolutely not negotiable. This is necessary to preserve safety. When you are under the hood, practicing flight by reference to instruments, you should start by telling your safety pilot (whether it’s me or somebody else) “I’m delegating the traffic-spotting to you”. The safety pilot should give you a readback on this, saying something like “I accept the delegation”. You should insist on this. You remain pilot-in-command and you even retain a share of the responsibility for traffic separation. Before turning (except small shallow turns), ask “Clear right?” or “Clear left?”; don’t assume your safety-pilot has pre-cleared all turns. When practicing an instrument approach, I will tell you if/when we break out of the simulated clouds. If in doubt, you can ask whether we have broken out. This is another decisionmaking exercise. If we reach the missed-approach point or decision height and haven’t broken out, do not expect me to say anything at this point. I want you to decide on your own when it’s time to begin the missed-approach procedure. If I say “you’ve got the approach lights” it means you haven’t entirely broken out of the simulated clouds, but you have the option of continuing the approach in accordance with FAR 91.175(c)3(i). One of the standard ways to achieve a high level of safety is to use a layered approach: layers and layers of backups and crosschecks. For example, before takeoff, always check the fuel level by looking in the tanks. If you can’t accurately judge the fuel level by eye, use a pipette to measure it. Then see what the cockpit fuel gauges are reading. Crosscheck the two types of measurement. If they disagree, you’ve got a problem. Don’t lightly give away layers of safety. For example, if you don’t do a magneto check before each flight, it’s just a matter of time before one mag fails. You won’t notice this, especially if it is the right mag (since only the left mag is used for starting). Then it’s just a matter of time before the other mag fails in flight. You will notice it then, because the engine will suddenly quit. Having two magnetos doesn’t just make the engine twice as reliable; it makes it thousands of times more reliable. Pipetting the tanks and keeping an eye on the fuel gauges is thousands of times more reliable than either one separately. As discussed in section 12.7.4 there is a long list of cues you can use to make sure you aren’t landing with a tailwind and/or excessive airspeed. Sometimes some cues will be useless or worse: perhaps the windsock is not visible from pattern altitude, and perhaps the previous airplane used the wrong runway. And perhaps you will occasionally overlook one or two cues. However, that still leaves many, many cues that will keep you out of trouble. You have multiple sources of navigation information (dead reckoning, pilotage, VOR, GPS, ATC radar) which can be cross-checked against each other. You should pay attention to anything that peels away one or more layers of safety. Keep track of how many layers remain. If one magneto fails, park the airplane until it is fixed! If the fuel gauges cannot be trusted, park the airplane until it is fixed! Do not rely on clock-and-dipstick alone, or on the gauges alone. In other publications, obstacle clearance is commonly discussed under the heading “controlled flight into terrain” (CFIT). The term obstacle clearance is preferable, partly because it puts a more positive spin on things: it is better to talk about your obstacle clearance successes than your CFIT failures. Also, the CFIT statistics are misnamed because they include collisions with trees, man-made structures, bodies of water, etc. that you might not have thought of as “terrain”. They also include taxiing into potholes and other things that you might not have thought of as “flight”. We ought to pay serious attention to the obstacle clearance issue, because statistics show a surprisingly large number of accidents where a perfectly good aircraft collides with an obstacle. You would think such accidents would be entirely preventable, so even one occurrence is far too many. Obstacles can be a factor during any phase of flight, including departure, enroute, or approach. A typical accident scenario goes something like this: At night (or in hazy weather), at an unfamiliar airport, the pilots crash into power lines or into a hillside. Let’s analyze this scenario using our notion of layers of safety. Let’s ask what “caused” this accident. Did they crash “because” of the obstacles? If they had been flying somewhere with more benign topography, they wouldn’t have gotten into trouble. Did they crash “because” they made a wrong turn? Presumably every airport has some path that airplanes can safely follow on takeoff. Perhaps they weren’t familiar with the correct procedure, or perhaps they just neglected to follow the correct procedure. Did they crash “because” of darkness or hazy weather? If it had been daytime in clear weather, they would have seen the approaching obstacle in time to turn away. We say this accident had at least three causative factors. Each of the factors was “a” contributory cause of the accident, but none was “the” sole cause of the accident. Multi-factor situations like this can be a challenge to your decisionmaking skills. Section 21.3 says you should not lightly give away layers of safety. Alas, it’s not always clear what “lightly” means. Sometimes there are good reasons for accepting some risk. Sometimes it’s OK to fly at night, or in hazy weather. Sometimes it’s OK to fly to an unfamiliar field. On the other hand, you must not let yourself become complacent. Even if you would be able to cope with each risk factor separately, you can still get into big trouble if/when multiple risk factors gang up on you. I would not recommend flying into a short, narrow, unfamiliar, unlighted strip at night in bad weather. Anything that involves operating at low altitudes peels off one or two layers of safety. In addition to ordinary approaches and departures, there are many examples including patrol, photo work, crop dusting, scud running (i.e. flying at low altitudes to avoid clouds), buzzing (i.e. flying at low altitudes to show off), and mountain flying. The departure phase and approach phase account for a huge proportion of the obstacle clearance problems. You need to worry about this even in regions that are not considered mountainous. A modest hill or a modest structure can be a serious threat if it’s near a runway. VFR at an unfamilar field at night (or in hazy weather) is particularly risky, as discussed in section 12.1.3 and section 13.7.7. In the enroute phase, the primary obstacle-clearance technique is to choose a suitable route and a suitable altitude, as discussed in section 14.8. A good secondary technique, to reduce the chance of mistakes, is to get radar advisories. The ATC computers know the minimum safe enroute altitude in each sector, and will sound an alarm if you get too low. Similarly, some fancy RNAV units now contain obstacle-clearance data and will give you warning of approaching threats. Another thing that may be of some help is an altitude alerter. This is a simple, cheap instrument. You tell it what you have chosen as your intended altitude, and it will beep if you inadvertently drift above or below that. Alas, this won’t help much if you punch an unsuitable number into the instrument (due to bad planning or whatever) and it won’t help if you are trying to fly through a mountain pass and get off-course horizontally. During the preflight check, you should walk around the airplane and check everything that you come to, in order. This is an example of using the flow pattern. After examining things according to the flow pattern, you should run the checklist to see what you overlooked. Checklists are good. Flow patterns are good. Neither one is a substitute for the other; instead, each is a backup for the other. Using them both is much, much better than using either one alone. Engine failure / restart (section 15.2.1). If you don’t use a written checklist, it is just a matter of time until you forget something. There are some checklists that you should commit to memory, such as rejected takeoff, spins, fire in flight, go-around, and possibly others, depending on how complex your airplane is. However, even these should not be entrusted to long-term memory. Short-term memory is better than long-term memory, so refresh your memory at frequent intervals. An excellent method is to recite the checklist out loud, while somebody else checks your version against the written version. I know a lot of pilots who fastidiously use a written checklist for preflight, but rely on memory for the approach and landing checklists. It is fairly easy to see how people fall into this trap: During preflight you are not strapped into your seat, and you are not busy flying the airplane. You can always take a minute to find the POH and read through it. In contrast, when you are setting up for a landing, the book is likely to be somewhere hard to reach and you’re too busy to do much reading anyway. Make a pocket checklist. Print up the checklists you are going to need during flight and fold them in such a way that they fit in a pocket. During preflight, put the list in a convenient pocket. If you habitually use a lap desk, tape a copy of the in-flight checklists to the lap desk itself. If space can be found, glue a copy of the in-flight checklists to the instrument panel. The pocket checklist should include the approach, landing, and go-around checklists, as discussed in section 12.1. If you fly more than one airplane, make sure you have an appropriate pocket checklist or lap-desk checklist for each of them. As you progress in your pilot career, you will be flying progressively more complex aircraft, and if you persist in using the same old checklist you will get into trouble some day. Some aircraft have retractable landing gear; some don’t. Some aircraft have cowl flaps; some don’t. Some aircraft require using carburetor heat; some don’t. Some aircraft require switching on the electric fuel pump for landing; others forbid it. Discipline yourself to pay attention to the checklist. Don’t just keep it in your pocket as a good-luck charm. Indications: Go left-to-right across the panel and check everything, including the gauges that aren’t part of your ordinary moment-to-moment scan: Fuel level, engine instruments, et cetera. Check that the directional gyro is aligned with the compass. Configuration: See if the fuel/air mixture is appropriate for this phase of flight. Make sure you’re not flying cross-country with the flaps extended. On more complex airplanes, there are more things to check: landing gear, cowl flaps, speed brakes, et cetera. Location: Where are we? Where’s the nearest airport? Mark this location on the chart, along with the time, as discussed in section 14.2. All too often, pilots get into risky situations without even realizing it. They don’t consciously decide to run a risk. They just take off on a supposedly routine flight, and by the time they notice a problem it is already too late to solve the problem. In theory, you can avoid such problems by paying meticulous attention to “everything”. However, in reality, it is unreasonable to expect people to be super-meticulous all the time. The trick is to be aware of what’s routine and what’s not. It helps to have a clear-cut set of personal minimums. Personal minimums are distinct from regulatory minimums. For instance, the regulations might permit a pilot with little experience to fly an unfamiliar aircraft on a maximum-range mission over water at night in moderate turbulence, then land in a 25-knot crosswind on an unfamiliar narrow obstructed unlighted runway, having had little sleep the night before ... but I don’t recommend it. Write down your personal minimums in the form of a checklist. Review the list before each proposed flight. If you are within the limitations, fine. If the proposed mission is slightly outside the envelope in one or two aspects, you might want to go ahead with it anyway – provided you are super-meticulous. The checklist is warning you that this flight is not routine. At least _______ runway length for _______ airplane for density altitude below 2000 feet. At least _______ runway length for _______ airplane for density altitude between 2000 and 5000 feet. At least _______ runway width. At most _______ knots gust component along the runway. At most _______ knots across the runway, including gusts. At least ____:____ fuel reserves. Ceiling _______ and visibility _______ for VFR. Ceiling _______ and visibility _______ at destination for IFR. Survival equipment for flight over wilderness. Survival equipment for flight beyond gliding range from dry land. At least _______ hours experience in this make & model. At most _______ pressure altitude without oxygen mask. Mountain flying? Bush flying? Obstructions enroute? Obstructions near the airports to be used? Low-altitude operations? In-flight “how-goes-it” checkpoints and “proceed/divert” checkpoints. Specialized skills are required for mountain flying, bush flying, low-level patrol, crop dusting, aerobatics, formation flying, et cetera. Beware of the obstacle-clearance issues listed in section 21.4. The first time you fly into a big, busy place like O’Hare, you might want to take along an instructor or at least a copilot who’s been there before. Hand-propping (i.e. starting the engine by pulling on the propeller) is potentially very dangerous. You may have seen it done in some old Hollywood movie, but that doesn’t mean you’re qualified to do it. Don’t try it unless you’ve got a good reason and have been thoroughly trained on the procedure. If you routinely fly solo out of a short field, it doesn’t prove you can depart from there carrying three large passengers and their luggage. Maybe you can, maybe you can’t, but it’s not routine, so you need to get out the book and redo the weight & balance calculations, the performance calculations, et cetera. These are just a few examples out of many. It is your responsibility to recognize when a situation is outside the envelope of your training and experience. It is your responsibility to acquire whatever skills are required. Don’t try to impose your personal minimums on the pilot next door. Yours will be too strict in some aspects and too lax in others. Your personal minimums are designed by you, for you. That’s why they’re called “personal” minimums. The idea of personal minimums applies during the whole flight, not just during preflight. In some cases you should establish specific personal checkpoints for a specific flight. For instance, if you’re flying into questionable weather, pick a specific checkpoint where you will get an updated weather report and decide whether to divert or not. Similarly, if it’s a maximum-range mission, establish checkpoints along the way, where you will re-evaluate the headwinds, fuel quantity, et cetera. The idea is to notice early if Plan A isn’t working, so you can execute Plan B while there’s still time. You need to notice things. That means more than just seeing things; you need to appreciate the significance of what you are seeing. Suppose that during the preflight check you see a red light on one wingtip and a green light on the other wingtip. Are you sure you would notice if they were interchanged, so that both wingtips had the wrong color? Suppose you see that the tow-bar is lying loose in the back of the airplane. You could just leave it that way, on the theory that people have flown the airplane hundreds of times in that condition without getting into trouble. On the other hand, it would be smart to consider the possibility that you might get into an unusual attitude (as mentioned in section 11.1) or even a minor crash. You don’t want the tow-bar to come whizzing toward you like a spear. Leaving it loose is needlessly throwing away one of your layers of safety. Anything that can’t be stowed securely should be left on the ground until you get back. Suppose you find a puddle of oil underneath the engine. You must be skeptical about where it came from. I’ve seen puddles on about 20 occasions. Usually it’s just because some klutz spilled oil while trying to add it to the crankcase. However, on one occasion it was due to a moderately serious leak in the engine, and on another occasion it was due to a very serious crack in a cylinder, the sort of crack that will get rapidly worse during flight. The only way to know for sure is to take off the cowling, mop up the mess, run the engine for a few minutes, and check for leakage. That’s a lot of bother, but it’s preferable to risking in-flight engine failure. You want to be properly skeptical without being paranoid. Nothing in this world is perfect. If you cancel the flight whenever the airplane is not perfect, you’ll never go flying. Judgement is required. Also: Piloting requires flexible thinking. Do not think you can plan a flight and then fly it exactly as planned. If Plan A isn’t working, don’t persevere with Plan A! We need crisp execution of Plan B. The very first takeoff on my private pilot checkride was supposed to be a simulated soft-field takeoff. That requires, among other things, not stopping after leaving the run-up area, lest we sink into the simulated mud. I was nervous. I wanted to make a good first impression. We were cleared for takeoff on runway 15 Left. Another aircraft was cleared to land on runway 15 Right. As I turned onto the runway, I heard Tower yelling at the other guy, pointedly reminding him to land on the right. I didn’t hear any response. I had no idea whether the other aircraft was near or far; all I could do was try to imagine what could cause Tower to say such things. I imagined that the other pilot was planning on landing on the left and was persevering with his Plan A even though he’d been cleared to do something else. I didn’t like what I was imagining, so I pulled the throttle to idle and stomped on the brakes. I also keyed the transmitter and said “Tower, Two-Four-Kilo is gonna hold our position for a moment”. Now I was really nervous. I had planned to comply with all ATC clearances, such as takeoff clearance. I had also planned to comply with the examiner’s request for soft-field procedure. Despite all that, there I was, stopped on the runway. My Plan A was in shambles. I had no idea whether holding my position would make things better or worse. I figured it was a 50/50 chance. The deciding factor was not the odds but the relative payoff: if there’s going to be a collision, I’d rather have a collision on the ground than in the air. A moment later, the other aircraft flew right over top of us, about 10 feet up. My Plan B was starting to look pretty good. Tower said “Two-Four-Kilo, advise when you’re ready for departure”. I said “as soon as that guy is out of our hair, we’re ready”. Tower acted like it was no big deal, and just said “Two-Four-Kilo, runway 15 Left, cleared for takeoff”. The examiner sat there with his poker-face on. I couldn’t tell whether or not he approved of what I’d done. Looking back with the benefit of years of PIC experience, I’m quite sure I did the right thing, and I’m quite sure the examiner and the tower controller were glad that I deviated from their instructions. Still, it is worth remembering that at the time, I was uncertain about this. I found the decision difficult and stressful. People aren’t born with advanced decisionmaking skills. Training is needed. Be smart about using all the resources available to you. If you have a copilot, that’s an important resource. You can delegate certain tasks to your copilot. A very useful technique for expediting a flight is to let one pilot do the pre-flight walkaround while the other deals with weather, flight plans, et cetera. In busy airspace, it works well to let one pilot work the radios while the other does everything else. Copilots and even passengers can help spot traffic. There are many other examples of effective collaboration. Entire books have been written on the subject. I’ve seen situations where each pilot assumed the other would take care of something, but it never got taken care of. I’ve even seen the following: It was time to toggle to a new frequency. One pilot pushed the “toggle” button. The other pilot pushed it also. As a result, the frequency was not what either pilot was expecting. To prevent such problems, make sure there is agreement about who is pilot-in-command. If you are PIC, you retain final authority and responsibility for everything. If you delegate something, make sure the delegation is understood and carried out. If you are second-in-command, make sure the PIC knows what you’ve done and not done. Learn from the story of Eastern Airlines flight 401. They crashed an airliner into the swamp partly because all three pilots were preoccupied with debugging a landing-gear indicator light. (Of course this is only part of the story.) Whether you have one pilot on board or three, don’t let a small problem interfere with your basic responsibility to fly the airplane. That includes maintaining a safe altitude, seeing and avoiding other traffic, et cetera. If you have more than one pilot, let one fly the airplane while another debugs the problem. Resource management is commonly called “cockpit” resource management (CRM), but it should include resources outside the cockpit, notably Flight Service and ATC. A related issue is cockpit leadership. If you are PIC, don’t act like Captain Bligh. Encourage your crew members to speak up if they see anything questionable. Keep them informed as to your intentions, so that they will be better able to notice if something unintended is happening. If you are a crewmember, it is your duty to speak up if you see something amiss, no matter how surly the PIC is. I tell all my students: I cannot teach you more than a tiny percentage of what you need to know. My job is to get you started in the right direction, to motivate you to set high standards for yourself, to help you learn how to learn, and get you to a point where you can safely teach yourself the rest. Benjamin Franklin had virtually no formal education. he might have amounted to something. Do not think of private pilot training as merely a way to pass the checkride and get a certificate. Think in terms of the standards, not just the test. You want to meet or exceed the standards on the day of the checkride, and the next day, and every day thereafter for the rest of your life. Don’t train to the test. and then try to do even better. To maintain and increase your skills, you need to keep on learning, thinking, and practicing. Most of what you need to know, you will have to learn on your own. The goal of the formal training is to get you to the point where you can do what Ben Franklin did: teach yourself. Being a good teacher is hard work, even if you are only teaching yourself. Connection-based learning: It has been understood for well over 100 years1 that not all memories are equally useful. The way to make a memory useful is to mull it over, checking to see how it connects – or conflicts – with other things you know. This takes time and effort. To say the same thing in slightly different words: The process of getting information out of your brain is quite different from the process of putting information in. Recall depends on connections. At the moment when you need to recall a particular piece of information, it’s too late to go back and create all the necessary connections. The connections need to be made in advance. Making yourself smarter not depend on working harder at the moment when information is needed. Instead, it depends on how you live your life in the months and years leading up to that moment. For one thing, some facts are so arbitrary that they cannot be connected in any logical way to anything else you know. For example, traffic drives on the right side of the road in the US, but on the left side in Japan. This is an arbitrary rule, without any logical basis, so it has to be learned by rote. Alas, wrong things can be learned by rote, just as easily as right things. Something learned by rote can be recalled very quickly ... if exactly the right stimulus is supplied. If the stimulus is not exactly right, the rote-learned fact will be come to mind very slowly, if at all. Repeated practice tends to lay down a memory of the usual case, without teaching you much about the unusual cases. As a pilot, your job is to handle the unusual cases. An untrained 12-year-old can fly the plane just fine under “normal” cruise conditions. You should learn by rote the single-engine engine-failure checklist by rote: Aviate, Navigate, Investigate, Communicate, Secure. If somebody wakes you up in the middle of the night and asks you for this checklist, you should be able to recite it verbatim, immediately, without thinking. You should also understand each of the items on the emergency checklist. With a little thought, you should be able to explain the meaning of each item, explain why it is on the list, and explain how it is connected to other things you know. You should learn by rote the basic math facts, such as the short multiplication table. For example, you should learn by rote the value of 7×8. You should also understand multiplication. For example, you should know how 7×8 is connected to 8×7, to 7×7, to 8×8, et cetera. This deeper, more thoughtful knowledge means that if your rote memory of 7×8 is ever lost, or ever open to doubt, you can reconstruct it and check it in several different ways. Also beware that rote memories tend to be narrow and brittle. As mentioned in section , it is a tremendous mistake to believe the proverb that alleged “practice makes perfect”. The truth is that practice makes permanent. If you are practicing the wrong things, practice is worth than nothing. The Spiral Approach: It is good practice to introduce eacn new without much detail, then introduce the next idea without much detail, and so forth. Then spiral back and cover each of the ideas in greater detail. This makes sense in terms of connection-based learning, because the first time you see an idea, you might never have heard of all the things it ought to connect to. However, the second time around, you have been introduced to lots of other ideas, so you can make a much richer set of connections. The Building-Block Approach: When faced with a large, complex task, you should take it apart in to smaller blocks. Learn each block separately. Then combine the blocks two at a time, three at a time, and so forth. Finally, combine all the blocks to produce the desired overall edifice. For example: Nobody learns how to land the airplane by practicing landings. Instead, we practice various simpler tasks: taxiing on the centerline by reference to the edge line, flying along a road, slippping along a road, learning how the airplane responds to the controls in slow flight, learning to judge height and timing, et cetera. During lessons, you have presumably relied upon the instructor to break the overall task into manageable blocks, but if you are going to teach yourself, you need to do this for yourself, or at least remember how it is done. For example: If you are having trouble with your landings, practicing defective landings over and over again is not a good idea! Go to the practice area and work on the building blocks one by one. Respect the Subconscious: We have a relatively easy time talking about conscious, formal, sequential thought. However, more than 99.9999% of all thought is subconsious. It is massively parallel, not sequential. For example, if I show you some ordinary object and ask you to say its name, you can come up with the name in a fraction of a second. There is absolutely no way you could do that by sequentially running down a list of all the words you know, looking for a match. Instead, you can search your memory in parallel. Millions of thought processes are continually happening in parallel. This is why the learning process is guaranteed to be tricky: It involves using your conscious mind to tell your unconscious mind what to do. This is possible, but not easy. Rote memory involves very little thought. However, rote memory by no means the only type of memory. Connection-based memory involves a great deal of thought. Indeed, the vast majority of what we call thought involves racking your brain, searching your memory for ideas that can be brought to bear on the problem of interest. It is beyond the scope of this book to cover all of learning theory. The most we can do here is convince you that it is worthwhile to think about thinking, and to learn about learning. These are interesting, complicated, and important topics. Reference 6 is a good place to get started. Consider the process of landing the airplane. There are many many variables involved: X-position, Y-position, Z-position, X-velocity, Y-velocity, Z-velocity, yaw-angle, pitch-angle, roll-angle, yaw-rate, pitch-rate, roll-rate, throttle setting, flap setting, headwind component, crosswind component, lighting conditions, et cetera. Suppose we separate out one of these variables and make a scatter plot, such as figure 21.1, where there are 400 data points, each represented by a vertical tally mark. 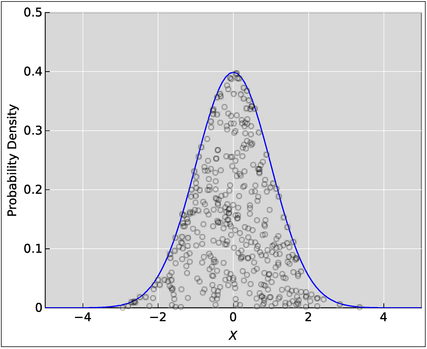 You can see that the data points are clustered near X=0. 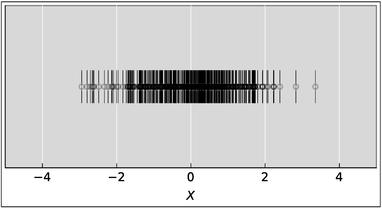 Figure 21.2 shows another way of plotting the exact same data. In this figure, the X-position of each data point is meaningful, and indeed has the same meaning as in the previous figure. In contrast, the Y-position of each data point is not meaningful. The data points have been arbitrarily and randomly spread out in the Y-direction, to make them easier to see. 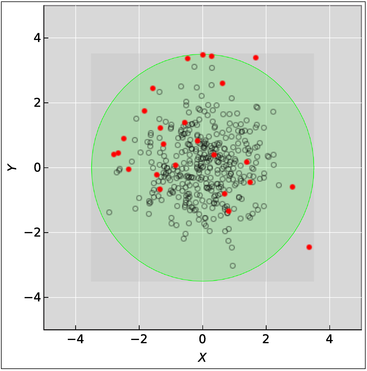 Next, we keep two variables rather than one, and make a two-dimensional scatter plot of the same 400 data points, as shown in figure 21.3. Yet again, you can see that the data points are clustered near X=0 and Y=0. However, we are most interested in the points that are farthest from the center. These are shown in red in figure 21.3. These points are not clustered near the center; they are spread out all over the place. These points are far enough from the center to get you into trouble, but no so far away as to have negligible probability. You can begin to understand what’s going on by looking at a globe representing the surface of the earth. Look at how much area is in the tropic regions (within 23.5∘ of the equator) compared to how little area is in the arctic and antarctic regions (within 23.5∘ of the poles). As a rule, we can say that most of the area is near the equator. A related rule says that most of the interior volume is near the surface. These rules become even more strongly true when we consider abstract high-dimensional spaces, such as the space spanned by all the variables that influence the landing. This space has at least 15 dimensions. In figure 21.3, imagine that the green area is not just a two-dimensional disk, but rather the projection of a three-dimensional sphere, or (better) a high-dimensional hypersphere. All of the red dots are outside the sphere. Some of are outside the sphere in the ±X or ±Y direction, some are above or below the sphere in various other directions ... and most of all, they tend to be outside the sphere in various cockeyed diagonal combinations of directions. Remember: In a high dimensional space, most of the interior volume is near the surface. This phenomenon is called sphere hardening. The probability per unit volume is lower at the surface than it is near the center. However, because of the enormous volume near the surface, the total probability of off-center events is much larger than you might have guessed. Another name for this is the Anna Karenina effect: All easy landings are alike; every tricky landing is tricky in its own way. When you get into trouble, it is almost never because of any one factor. Instead, it is because a large number of factors gang up on you. The X-discrepancy is not large, the Y-discrepancy is not large, the Z-discrepancy is not large, and so forth, but when you add up 10 or 15 discrepancies, it gets to be a problem. This explains why you cannot learn to land the airplane by rote. Sure, you can learn to handle the easy cases by rote, because they are all alike ... but the tricky cases are all different. Even if you have the sort of “Rain Man” memory that would allow you to remember all the possibilities by rote, you could not possibly afford the time (or the fuel) to practice enough landings to see all the possibilities. This is why we need to take a thoughtful approach, rather than the rote approach. This is why we need the building-block approach. That is, rather than dealing with one impossibly-difficult 15-dimensional problem, we break it into a large number of reasonably-manageable one- or two-dimensional problems. The first step toward avoiding mistakes is to realize that mistakes are possible. Be careful not to fool yourself ... keeping in mind that you are the one person you can most easily fool. The next step down this road is to check the other guy’s work. Don’t believe everything you read. This is related to looking for connections, as discussed in section 21.10.1. It is also related to the skepticism discussed in section 21.8. When pilots get together, they often trade stories about accidents or near-accidents. Non-pilots are sometimes shocked; they think it’s ghoulish. However, that’s not the point at all. The point is to learn what led up to the problem, and what can be done to prevent a recurrence. Various pilot-oriented magazines feature every month a new anecdote from some pilot who learned something the hard way. The National Transportation Safety Board keeps records on all accidents and incidents. These are available on their web site. NASA’s Aviation Safety Reporting System collects reports on untoward events, even those that don’t result in accidents. Every month they publish a discussion called Callback which is available from the NASA website and otherwise. The AOPA Air Safety Foundation puts out the annual Nall Report summarizing statistics from multiple sources, taking a general-aviation point of view. This is available from their web site and otherwise. There are many published books containing aviation biographies or collected stories. Part of the romance of aviation is to do everything better than necessary. If the runway is 50 feet wide and the airplane’s wheelbase is 10 feet wide, it is technically possible to land on the left half or the right half of the runway. Instead, though, everybody tries to land exactly on the centerline. If you were off by one foot last time, try to be off by half a foot next time. This is done partly for fun, just for the challenge of it, but there is also a serious purpose to it, for the following reasons. Safety is not directly affected by your best performance, or even your average performance. What matters, directly, is your worst-ever performance. This is called the minimax principle: make sure your worst-case performance is good enough. This partly involves skill, but largely involves using judgement to stay out of situations (distractions, fatigue, bad weather, etc.) that might cause your performance to be significantly worse than usual. High standards contribute indirectly to safety in the following way: If your usual tolerances are tight enough, then even on the super-rare occasions when your performance is ten times worse than usual, you will still have a wide margin of safety. See Henry James, “Talks to Teachers” (1898). The roots of the idea can be traced back more than 2000 years: The “method of loci” was mentioned in the book Rhetorica ad Herennium (circa 90 BC).